Dental hygiene is important for maintaining a healthy mouth. It is easy neglectful these hygiene practices, but doing so can leave you with cavities, gum disease, and more. To keep your mouth in top shape, you must to a bit more than brush your teeth in the morning and evening. Here are three must-do for oral health. Simply brushing your teeth is not enough to make sure all the food particles and other bacteria are being removed. The American Dental Association (ADA) recommends brushing your teeth at a 45-degree angle to your gum, stroking across the sides and tops of your teeth using short back and forth motions. Then, use vertical strokes on the backs of your teeth. Remember to floss at least once a day. Just like brushing, there is a proper flossing technique to ensure you are removing all the plaque and bacteria from the areas your brush can’t reach. 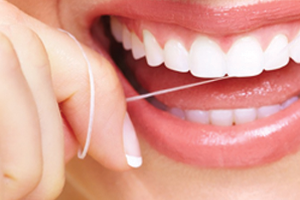 Use a long enough piece of floss that you can move to a new area of the floss so you do not put any of the bacteria back into your teeth. Floss in a ‘C’ shape ensuring you are wrapping the floss fully around the tooth. The most effective way to keep your toothbrush clean is to rinse it off when you are finished and allow it to air dry. Covering the tooth brush can allow bacteria to form, which you’ll put in your mouth the next time you brush. Over time, the bristles on your toothbrush start to deteriorate and won’t be as effective at cleaning your teeth. Replace your toothbrush every three to four months. Implementing these tips in your daily routine will have you on your way to a clean and healthy mouth. Other factors, like excessive snacking on sweets or drinking a lot of acidic beverages, can contribute to tooth decay. Avoid this as much as possible and make sure to drink lots of water.